Home For Sale? Are You Getting Offers Or Are You Getting Tracked? I was out on my morning walk and happened to pass by a home for sale, and my workout partner (not a real estate agent) pointed out that the home was brand new to the market. He plans on buying a home in the neighborhood where we walk sometime in the near future, so he really has a strong idea about the value of every home for sale in the area. In fact, he has taken our "Home Buying For Smart People e-Course", so he's positioning himself to buy smart when he does find the right home. So as we walked by that new home for sale, he joked that "he's a stalker" and already knew about the house. He added that he might even add the property to our home tracking tool to see when the seller reduces the price. And that is the point of this article! Is Your Home For Sale Getting Tracked Or Getting Offers? Whenever I talk to a homeowner getting ready to offer their home for sale, I tell them about "The Stalker Looking At Homes In Your Neighborhood"
Now this is a good type of stalker, and my workout partner is one of them. He knows everything about the Tallahassee neighborhood where he would like to move. He knows what homes have been selling and what has sold. He knows every listing, whether listed by a real estate company or listed directly by the owner. He would be the first to tell you that if a home is put on the market and it meets his general requirements (remember, his top priority is to be in the neighborhood), then if it is well priced, he is going to make a fast and compelling offer on the home. So the lesson for would-be home sellers is make sure you have the perfect initial asking price. You should sell your home right away if you want to get top dollar, because the stalker in the neighborhood is the one most motivated to buy your home for sale. If the stalker isn't making an offer, then he or she will likely use the new tracking tool available with our property search tool. 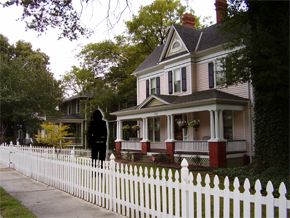 The tracker allows the stalker to enter in a desired price for a property, and the tool will send a notification email when the homeowner reduces their price to that point. The stalker knows that a seller dropping a price is far easier to negotiate with than the one who hit the market correctly priced. I have written dozens of articles about selling a house in today's turbulent real estate market. There are many home selling tips from marketing through negotiations, but they all reference the critical importance of choosing the right real estate company and then determining the perfect initial asking price. If you have to lower your price to get your home sold, then my experience has taught me you failed to get the "best" buyer for your home when you hit the market. Remember, you find every home for sale in the Tallahassee real estate market on our hot new property search tool, so happy house hunting and let us know if we can help. Well said. We are RE Investors. Just sold a property in south MD. On market 5 days. Went under contract and sold at the asking price.